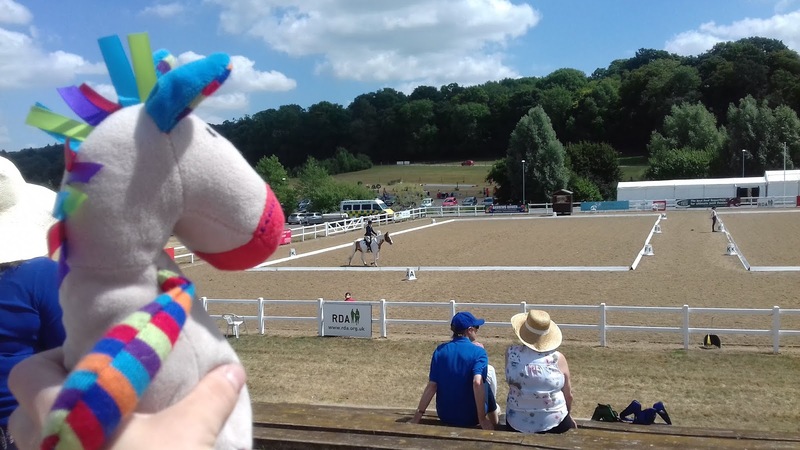 Earlier in July the Group made the long trip to Hartpury College in Gloucestershire for the RDA National Championships. This year we had thirteen riders who had qualified to compete, out of our eighteen regular riders. Boysie (Drunkeen Boy) and Danny were the trusty steeds of the weekend, with Chris and Olivia taking their own Quintus and Uma. Horses, coaches and other volunteers rose to the occasion and the Group secured some brilliant results. Read on to find out more! Our volunteers always do fantastic work. Here are Helen and Laurie dashing off to their next job! both have qualified for the RDA SEIB Search for a Star final! Emily riding her dressage test on Boysie, closely watched by Zebedee the RDA East Region mascot! Grade 3 Championship test - Eleanor 1st and Class Champion (Boysie). This was a great victory in a very competitive class, made all the more impressive by the fact that Eleanor's score of 77.05% was a full 5% higher than that of the rider in 2nd place, and very nearly the highest Championship dressage score of the whole weekend. 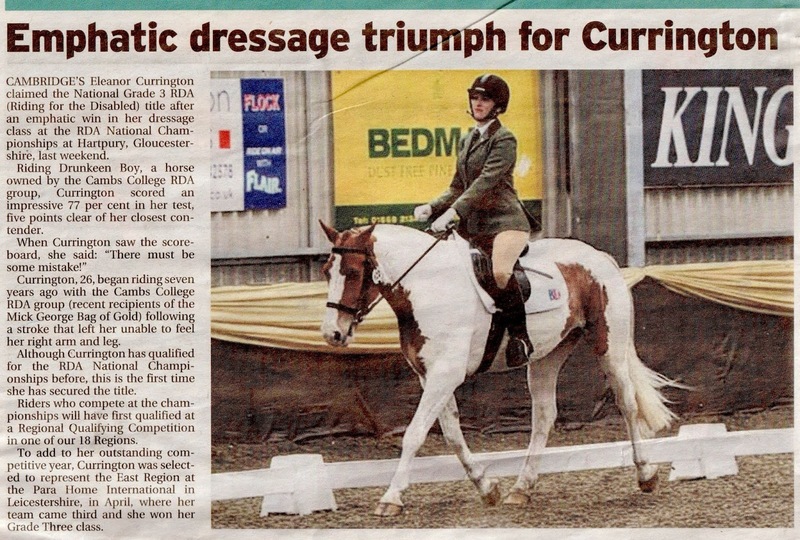 This remarkable performance has been documented in The Cambridge News (see below) and The Cambridge Independent (click here to read the article online). An article on Eleanor and Boysie in The Cambridge News. Volunteer, Sarah, giving Danny a pep talk, whilst Kathryn finishes tacking up.